A parenteral semi-synthetic broad spectrum cephalosporin with good tolerability profile. Excellent susceptibility against most Gram positive & Gram negative aerobic & anaerobic pathogens with overall bacteriological eradications at least 85%. Inhibits biosynthesis of cell wall mucopeptides & exhibits minimal immunosuppressant activity. Safe & effective in the therapy of acute bacterial lower respiratory tract infections with 92% clinical efficacy. Effective & safe alternative in Clindamycin & Gentamycin treatment of inta abdominal infections. A potent,highly specific inhibitor of a wide variety of beta-lactamases produced by common gram-negative and gram-positive aerobes and anaerobes. Forms a protein complex with beta-lactamases and irreveribly blocks their destructive hydrolytic activity. 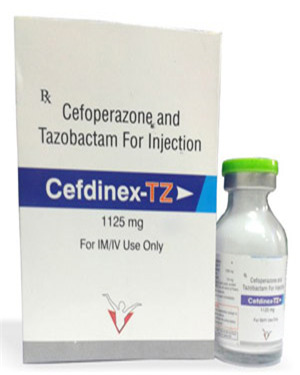 Study corroborates the efficacy of the beta lactamase inhibitor tazobactam in improving the spectrum of activity and efficacy of cefoperazone. Generally acts as an irreversible inhibitor and inactivates both plasmid and chromosomally mediated beta-lactamases.